Price indicated is for a set of 6 cradles. 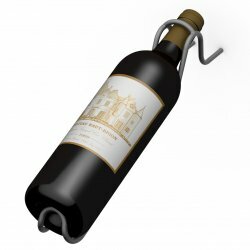 The Cradle Peg System is a great alternative wine rack peg system. Both the punt and the neck are held with this ingenious twisted metal wine cradle. The cradle is earthquake resistant holder for wine bottles - but no guarantees. The wine saddle is installed in your 1/2" thick custom panel. The bored holes are 5/32" diameter. Once the cradles are secured onto the panel then the panel gets mounted on the wall.